Cut day in the NFL is more intense than ever. Teams now make the leap from 90-man rosters to the final 53 in one jump, not in stages as was previously the case, and that leads to some genuine quality players being shown the door because they fell victim to the numbers game on a particular roster. Key Stat: Had just one drop in 13 targets this preseason despite numerous contested catches. 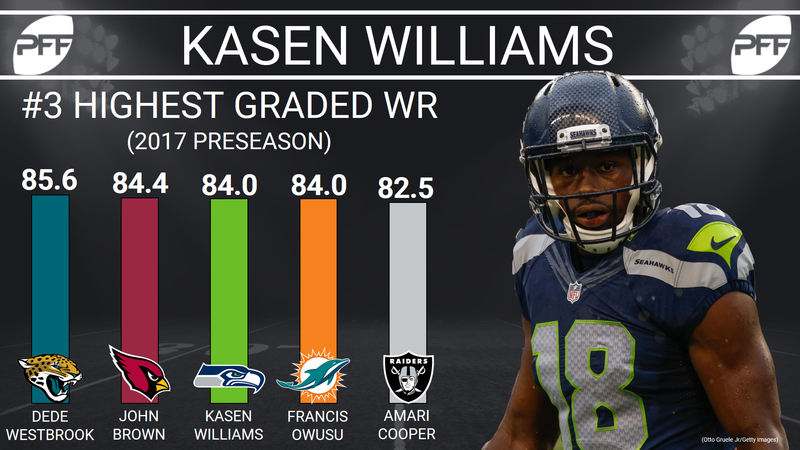 Kasen Williams was one of the darlings of the preseason with the Seattle Seahawks. He caught nine of the 13 passes thrown his way for 208 yards, 35 of which came after the catch, and against Minnesota one of those passes – a 27-yard one-handed effort – came against one of the game’s best cornerbacks in Xavier Rhodes. Williams was signed by the Cleveland Browns after his departure from Seattle. Key Stat: Played 199 snaps, 20 more than any other edge rusher in the preseason. Another of the preseason MVPs, it’s difficult to envisage what more Cap Capi could have done in preseason to earn a roster spot with the Cardinals. His overall PFF grade of 84.8 was fourth among all edge-rushers and he played 20 more snaps than any other player at that position, generating two sacks, five hits, 11 hurries and ten defensive stops over his 199 snaps. Capi had pressure in all five of his preseason games. He was signed to the New York Giants practice squad. Key Stat: Across the past two preseasons, Seau has four sacks and 10 hurries on just 179 total snaps. Seau impressed in the 2016 preseason as a pass-rusher, notching only one sack, but having six additional hurries, but this preseason run defense was far better as well, and he matched his total pressure count from the season before. Seau looks like he can consistently have an effect on the edge and could make noise if he finds playing time in the regular season. He has since signed with the Buffalo Bills practice squad. Key Stat: Caught 73.7 percent of the passes thrown his way this preseason with no drops. 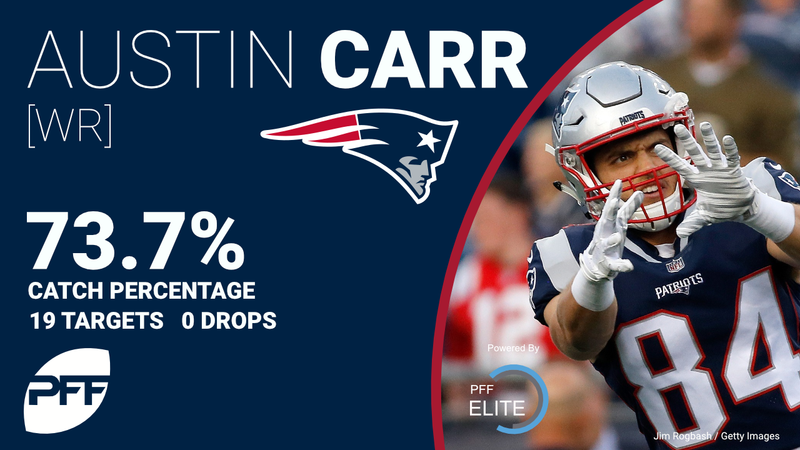 When Julian Edelman went down for the New England Patriots, many expected Austin Carr to be a lock for the Patriots roster, but despite catching 14 of the 19 passes thrown his way this preseason for 153 yards and a pair of scores, he was cut loose. Those passes were largely underneath and he averaged just 2.1 yards per reception after the catch. Carr was the highest-graded wide receiver in the nation in his final season in college, and showed this preseason he can be effective in the NFL. The Saints signed Carr after his showing this preseason. Key Stat: Led the nation with 83 total pressures in 2016, his final season in college. Dimick was an impressive edge rusher last season in college, racking up 83 total pressures to lead the nation, 30 more than Myles Garrett albeit on considerably more snaps (around 150 percent more). He isn’t anything like the athlete that Garrett is, hence the disparity between No. 1 overall draft pick and an undrafted free agent, and he saw just 44 snaps this preseason with the Jaguars, but in 32 pass-rushes he notched six hurries and graded well. He is a player that belongs on an NFL roster. The Jaguars stashed him on their practice squad. Key Stat: Missed just one tackle in 11 attempts this preseason, recording seven defensive stops. 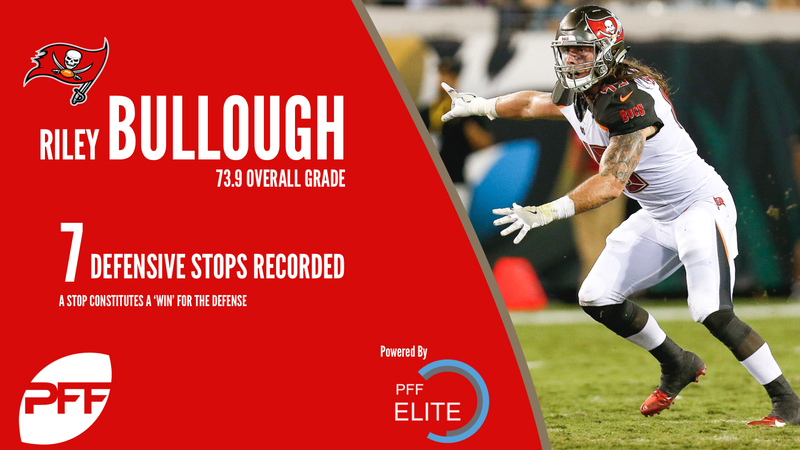 One of the stars of Hard Knocks this year, Bullough couldn’t escape the cut, but he has some intriguing traits and play that could see him make an impact, and the Bucs have signed him to their practice squad. He struggled in coverage against the Browns in the third preseason game, but coverage is typically his strength, and those three catches were the only three he allowed this preseason. Key Stat: Allowed just four total pressures in 483 pass blocking snaps last season at West Virginia. One of the highest-graded centers in college football last season, Orlosky allowed just four total pressures and no sacks over an entire season of play at West Virginia. This preseason with the Eagles he saw 71 snaps, playing both center and right guard, and though he did surrender a sack against the Buffalo Bills, it was the only pressure he gave up all preseason. Key Stat: Has missed just eight tackles in his career, on 217 attempts. Robert Blanton isn’t going to be confused for an all-pro safety any time soon, but every time he has seen the field in the NFL he has been largely solid, particularly in run defense. This preseason he didn’t miss a tackle and broke up a couple of passes in coverage Blanton could be a solid backup option for a team with safety concerns. Key Stat: Played 1,109 snaps last season as the Baltimore starter at center. Jeremy Zuttah was the starter for Baltimore all last season, surrendering three sacks, 29 total pressures and amassing an average grade as both a run blocker and pass protector. His overall grade of 76.7 is far from stellar, but still more than good enough to start in this league and he could help a team that finds itself without an answer on the offensive line. Key Stat: His PFF grade of 81.3 last season ranked 19th among all guards. Another player that was a full-time starter a year ago, Greco played 556 snaps last season across nine games in Cleveland at right guard, but was supplanted in the starting line up by the Browns in free agency, and became expendable on a roster that needs position flexibility from it’s backup linemen. Greco can still do a starting job in the NFL.